Last Thursday I finished the copy at the NGA. Now I want to share the last two sessions that led up to its completion. As I was not creating from scratch, but was copying, it took me longer to complete my version. My goal was to get as close as possible to his original painting, with an emphasis on matching the gesture and energy of his brushstrokes. Once I had covered the entire canvas with the thick impasto paint layers, I took a break from visiting the NGA. This provided time for all the thick paint layers to dry, which I needed to happen before my last painting session. Because some oil paint colors shift as they dry and because I painted this painting in large sections, it was important to me to dedicate an entire painting session to analyzing the entire painting as a whole. So for the last painting session, I started the day by “oiling in” the dry painting surface with refined linseed oil. This rejuvenated the colors back to what they look like in their wet state. By bringing up all the colors, I was able to assess how the various parts that were painted separately hung together. I set to work adjusting values and colors in the painting. Luckily, most areas were fine, or only needed some minor adjustments, and I was able to finish this stage of the process by the end of the day. The three main areas that required attention were: 1) lightening the value of the background on the right side of the canvas, 2) lightening the value of the foreground, and 3) adjusting the color and value of the vase. The painting is now home in my studio, drying further before I can varnish it. Once the painting is varnished, it will be ready to go home to the kind collector who commissioned me to paint this exciting painting for his wife. Having to keep your easel four feet away from the original painting, meaning you end up standing 6-7 feet away. Having to paint within the hours of 10am to 4pm, and with my mom responsibilities, I end up working within a more limited time period. Tungsten bulbs shining on the painting, and only natural light from the skylights shining on your canvas. This creates a color temperature shift from your painting to that of the original... I always am trying to make up for this difference. Setting over ambitious goals for each painting session. At the start of each session, I brainstorm what area of the canvas I am going to cover, and how I will sequence the steps. Often, I am over confident on how fast I will be able to accomplish such goals. Forgetting a supply or tool, such as my paint tube squeezer. A great tool to squeeze the super-stiff lead white out of its tube. Van Gogh painted most of this painting as one direct layer of paint. You can see areas of the raw canvas peaking through in places when you get up close to the painting, however the branch of roses in the lower left hand corner were painted on top of the background and foreground paint layers. This branch of roses was a later addition to the composition. It was like Van Gogh got the painting almost complete and then realized the lower left-hand corner needed something more. This is a tricky technique to achieve because I had to lay a lighter paint color on top of the wet and darker background and foreground colors. It is all in how you handle the brush, and the pressure you apply. And it was important to paint wet-into-wet here instead of painting in the background and coming back next week to paint in the lighter roses because in some areas I needed the under layers to mix some with the upper layers of paint, to help me define form. Also, as the painting ages and cures, the upper layers will become more transparent, creating a more nuanced effect. This aging process that an oil painting goes through as it cures and dries (which can take over four years to occur) is one of the features I love about working in oils. That sometimes you paint a certain sequence not for how it will look today, but how the oil paint will cure and ultimately look. As the artist, you are making decisions for the ultimate outcome, not just for the immediate result. Today was a day of progression. Working my way around the canvas. Working on this painting has made me more decisive about my brushstrokes. My mentor, Danni Dawson, recommended that I do not try to copy every exact brushstroke, but instead I need to strive to emulate the gesture and energy that Van Gogh’s brushwork has. Saying all this, I also admit that at times I do observe brushstrokes, visualize making them exactly as they are on the canvas before me and then I return to my copy and purposefully paint the strokes. This practice of stopping to understand, imaging the sequencing and movement of laying down paint, and then actually laying down paint has made me more aware of how important it is to think while painting and how mental involvement is so important in gaining a positive outcome. Creating art is as much mental problem solving as it is pushing paint around. When I began this session there was a tour of children with a guide and some parents in the same gallery as me. They were there looking at the new Van Gogh acquisition. While I was setting up I chatted with them about the copyist program and the reason why copying a painting is so valuable. To me the most valuable result of the experience is how it enables me to really get into the mind of the artist. I have to think about how they created something, figure out the sequencing of the steps, and constantly compare their work to what I am coming up with. Essentially it is learning through reverse engineering. Something that is proven to work and in my opinion it is one of the best ways to minimizing the time required to master a specific technique. With each copy I have completed, I feel as if I make gigantic leaps forward in my comprehension of how to create expressive artwork. With this painting, Roses by Vincent Van Gogh, I am really learning the important of value and color temperature. How these two characteristics to paint application is so important in creating a sense of dimensional space on a 2-D picture plane. When I copied, Jan Davidsz de Heem’s Vase of Flowers, I learned a ton about painting with layers of glaze. With this Dutch still-life painting, I also learned how to disconnect my time-oriented thinking from my creative-lose-track-of-time painting brain. It was with this painting that I learned the value of slowing down to really see what is in front of me. And now with this Van Gogh, I am learning how to see and make decisive decisions in this alla prima method of painting. For this session, this is where I began. And keeping to my plan to work outward, painting in a very direct manner, I began by fanning out from last week’s session. When working in a such a direct manner, it is especially important to focus on setting up the correct values and building up the texture like Van Gogh did. Copying this Van Gogh has made me realize how this painting incorporates a lot of the affects of a bas-relief sculpture. The majority of the leaves are laid down with minimal paint texture compared to the full impasto texture of the roses, with the petals being built up in a three-dimensional way. I have found that even the shadows that are cast by the thick impasto painting play an important part in giving dimension to the roses. I have been to the NGA two times since I last shared an update on this copy. For the third session, I brought in the full-size linen canvas to get a new copyist permit after the 8 x 10 study was completed. I blocked in the composition with thinned yellow ochre, making sure my scale was correct as this copy is a bit smaller than the original painting. For the fourth session, I began the laying in of the actual painting. As Van Gogh painted in the alla prima method, which means his work was usually executed in one painting session, I must work to complete the area I am working on within the day I start in that area. In order to keep with the expression and gesture of Van Gogh’s work, I want to minimize the amount of going back and correcting as I can. With this in mind, I choose to begin in the middle of the composition and to work out. 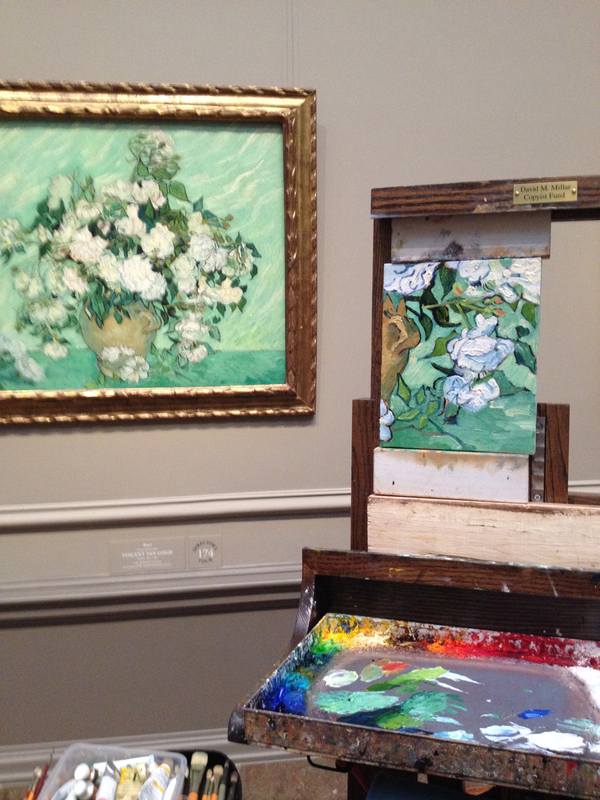 Two weeks ago I found myself back at the NGA working on another 10x8 study of Roses by Vincent Van Gogh. During this session, I focused on scaling the study down in size to be more in line with what the final full-scale copy will be. I also worked to vary the paint thicknesses to be more in line to the original. During my first study, I did not realize how much of the under canvas peeped through and how that affected the overall effect of the painting. By leaving areas of the canvas to peep through, the sense of depth is given more meaning in the impasto areas of the painting. Van Gogh was very masterful in how he used texture to reinforce the important areas of the painting and to visually create depth. This painting is almost like a bas-relief sculpture. It was while working on this second study, I also began to notice how Van Gogh used color temperature to give the illusion of visual depth as well. Lets look at this detail of the original painting…. See how the background and leaf are almost the same value inside the circled area, and see how the leaf still pops forward visually. Yes, the dark outline helps with this, but I think what really makes this work is that the leaf is a warmer green (yellow-green) then the background green (blue-green). Choosing the correct color temperature is very important when working on a painting, but it is when I see details like this in a painting that I really begin to contemplate how effective the correct color temperature is in creating three-dimensional effects on a two-dimensional canvas. Its not as effective. Color temperature is an important tool to use when painting. I am happy to share that the study was approved by my client, and I am now awaiting the arrival of the custom sized stretcher bars and linen so I can assemble the full-sized stretched canvas and begin on the final copy. Yesterday I found myself back at the NGA beginning a new copy. This time, I am focusing my effort on Vincent Van Gogh’s still-life painting of Roses. The copy is a commission, a thoughtful husband wants to celebrate his upcoming 10th wedding anniversary by surprising his wife. Vincent Van Gogh's Roses is an important painting, he proposed to her in front of this painting... I think this is one of the most romantic gestures I have ever heard of and I feel so honored to be a part of it. Because Van Gogh’s painting technique is all about decisive brushstrokes, impasto paint application, and bold color, I am beginning this copy by first completing 8x10 studies at 100% scale of sections of the painting. These studies will give me a chance to practice his paint application technique. When copying a painting with such energetic paint handling it is very important to move with confidence and speed. My mentor, Danni Dawson, always asserts that when copying such work, it is more important to capture the sense of gesture and emotion rather than copy each exact brushstroke. This is because people are drawn to confidence and mastery of the medium that is exhibited in such paintings. My goal with completing this first study was to get used to the way Van Gogh was likely to paint this subject matter. I wanted to learn about the sequencing of this painting, how he used color, texture, and pattern, combining all these aspects into a single composition. I began with a Prussian blue mixture, by blocking in the main shapes of a specific area of the painting, an area that had some of the background, table surface, the clay vase, and various rose foliage. Most of the roses were painting directly on the canvas surface with patches of the cream canvas tone peaking through, only a few areas were painted on top of previous layers of paint, making this painting an interesting one that requires a lot of pre-planning on my part. With this study, I learned a lot about how Van Gogh layered color and used value to create visual depth. At the end of the day I scraped down what I had painted, because I want to complete another study next week and investigate another area of the painting before I dive into the full-size version.